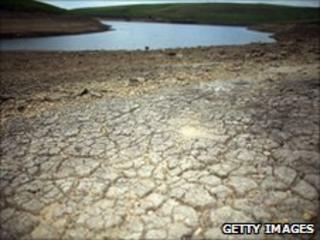 A hosepipe ban is to be introduced in most of north-west England for the first time in 14 years. The temporary ban, which will affect millions of householders in the region, will come into force at 0600 BST on Friday, United Utilities has said. The firm said the measure will help "safeguard essential supplies". Water levels in many reservoirs and lakes have plummeted to less than half their capacity due to the region's driest start to the year since 1929. The water shortage comes just months after hundreds of properties were flooded in Cumbria following severe storms. More than 1,300 properties were flooded across the county, with Cockermouth, Workington and Keswick worst affected. Despite spells of rain over recent weeks, supply levels have failed to sufficiently increase. Anybody caught flouting the ban may face a fine of up to £1,000. Householders in Carlisle, Allerdale, Copeland and the north Eden Valley, all in Cumbria, are not affected, as their water comes from a different supply to the rest of the North West. John Sanders, from United Utilities, said: "Despite some recent rainfall in the north of the region, reservoir levels are still significantly lower than we would expect at this time of year and are now at a point where we need to impose some temporary restrictions on our customers. "It is not a decision we have taken lightly, but a hosepipe can use as much water in an hour as a family of four would use in one day. "This ban will help us to safeguard essential water supplies to our customers if the drought continues." The ban will restrict the use of hosepipes or sprinklers for watering private gardens and washing private cars. People can still water their gardens with a watering can and wash their vehicles using a bucket and sponge, which use a fraction of the amount of water that a hosepipe or sprinkler does. The company issued warnings about the possibility of restrictions last month when it applied to the Environment Agency for a drought permit. The permit, which is still under consideration, allows them to take more water from Ennerdale reservoir, in Cumbria. The plans have been placed on hold as recent rain means Ennerdale is one area where supplies remain at reasonable levels. The firm is applying for new permits for Rivington reservoir, near Bolton, and Longdendale in Derbyshire. There will also be an application to take additional water out of Windermere, Cumbria. Why do we need a hosepipe ban?